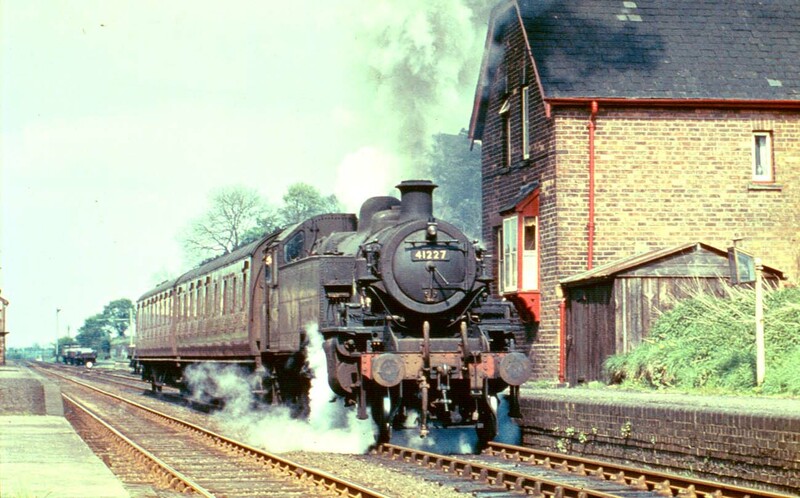 British Railways built 2MT 2-6-2T No 41227 leaves Dunchurch station for Leamington Spa (Milverton) on the last day of service. This was one of a pair of 2MT 2-6-2T locomotives operating the services on the last day, the other was fittingly classmate No 41228. Designed by HG Ivatt, the LMS' last Chief Mechanical Engineer, this Class 2 2-6-2T was a class of light 'mixed-traffic' steam locomotive introduced in 1946. The class, based on the LMS Stanier 2-6-2T which was, in turn, based on the LMS Fowler 2-6-2T, was introduced between 1946 and 1952. They were ten members of the class built by the LMS before nationalisation in 1948 which were numbered from No 1200 to No 1209. British Railways added the prefix '4' to their numbers so they became No 41200 to No 41209. A further one hundred and twenty locomotives were built by British Railways which were numbered from No 41210 to No 41329. Most were built at Crewe, including No 41272 which was the 7000th locomotive to be built there, with the last ten members of the class being built at Derby. Some fifty engines were fitted with push-pull equipment, these being No 41210 to 41229, No 41270 to No 41289 and No 41320 to No 41329. If you would like a copy of this photograph please visit LNWR Society Photo and quote reference: EsrC042.